The map gives an overview of all the warnings for icy roads for Europe. 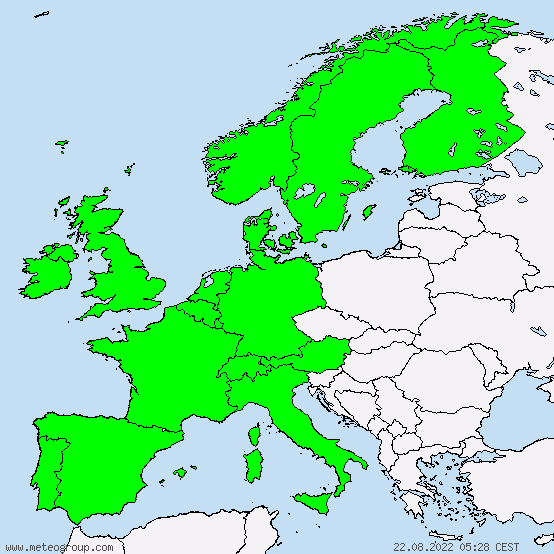 Areas respectively locations of Europe in dark green are the ones where icy roads / glazed frost / black ice and thereby risk of skidding have to be reckoned with. Icy roads can be caused by hoar frost, snow or freezing wetness. The detailed and reliable forecasts of such glazed frost events for Europe are very important especially for the traffic situation on motorways and other roads and the dependent road users, as well as for the accident service. Care must thus be taken on the roads of Europe due to icy roads / glazed frost! Professional and experienced meteorologists at the Severe Weather Centre continually adjust the glazed frost forecasts manually and make them cutting-edge 24 hours a day.